During his Tuesday practice round Rory McIlroy made a hole in one at the 16th of Augusta National Golf Club and the fans went nuts. ‘I’ve never heard a roar that large,’ said the Northern Irishman, who hit a seven iron 170 yards for an ace that ended his friendly match against Chris Wood. The world number three was practicing ahead of the year’s first major, where he will continue his quest to become only the sixth player to win the career grand slam. He’s already won the US Open with a record low score, the PGA Championship by a record eight-stroke margin of victory, and The Open Championship at the ripe old age of 25. 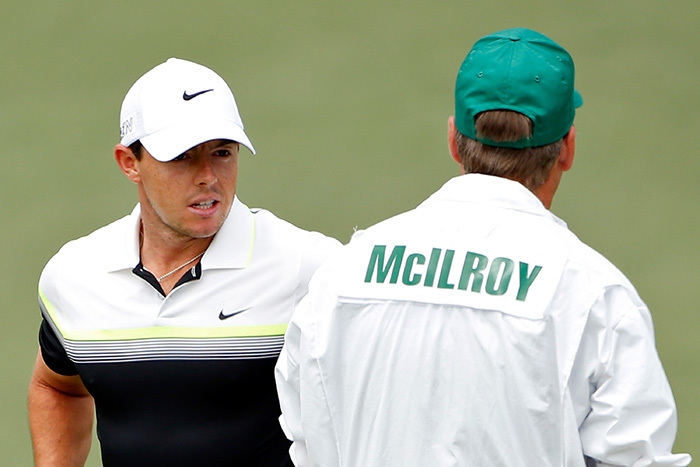 This week a McIlroy who is vastly different from his 20-year-old self arrived at Augusta to play his eighth Masters. He’s not the world number one any more. He’s been engaged and called it off, and is engaged again. He’s spending more time on his physique than ever before. And his game is on point. This is the McIlroy contenders should be scared of, one who has accepted the mantle of greatness and can shrug off the external pressures that come along with it. There are obvious elements of his game that suit Augusta. First off you need to be long off the tee, and few climb into the ball the way he does. Getting into position is the first hurdle, but it’s a second-shot course that demands accurate approaches. This is due largely to the tiered greens, which have plenty of slope and always firm up during Masters week. The subtle break of Augusta’s greens make reading putts difficult and the speed means that very few putts for par are three feet or less. There was plenty of hype over McIlroy’s flat stick magic, which was rare for such a big hitter, before Jordan Spieth began draining putts from everywhere and claimed the media’s attention. Of late it’s Jason Day who garners most of the media focus with his prolific wins and incredibly high ball flight. He has risen to world number one, but constantly shifts between playing superlative golf and being injured. McIlroy, meanwhile, is the constant. He hasn’t had a bad season since 2011 and is in sparkling form going into the week, fresh off a fourth-place result at the WGC-Dell Match Play. The young prodigy has come to terms with his expectations while still producing world-class golf. It’s that combination of maturity and skill that make him a favourite for the tournament.